For most of her four-decade-long career, photographer Jean Pagliuso focused her lens on the fashion industry and on Hollywood, producing images of celebrities meant for magazines and movie posters. 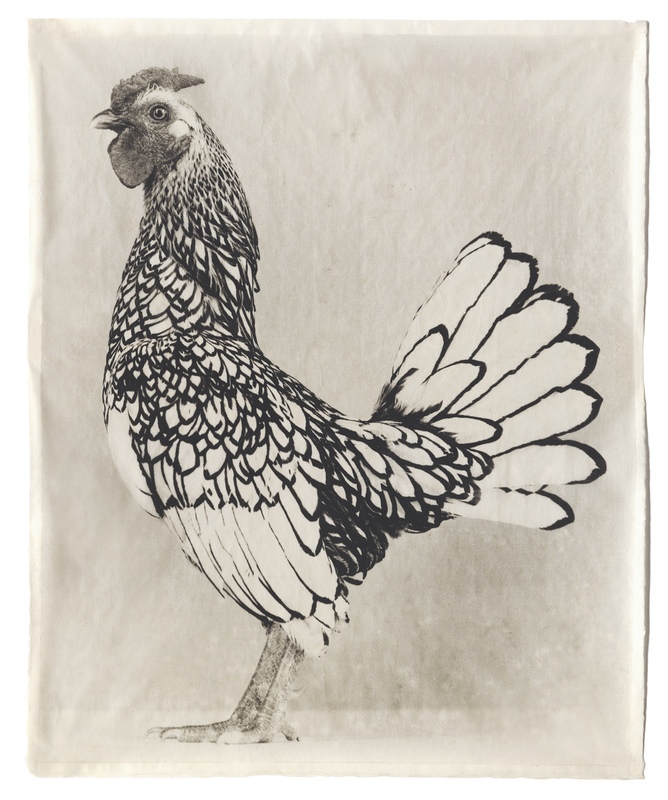 Her latest series, which began last year, spotlights a wholly different, unexpected model: the chicken. 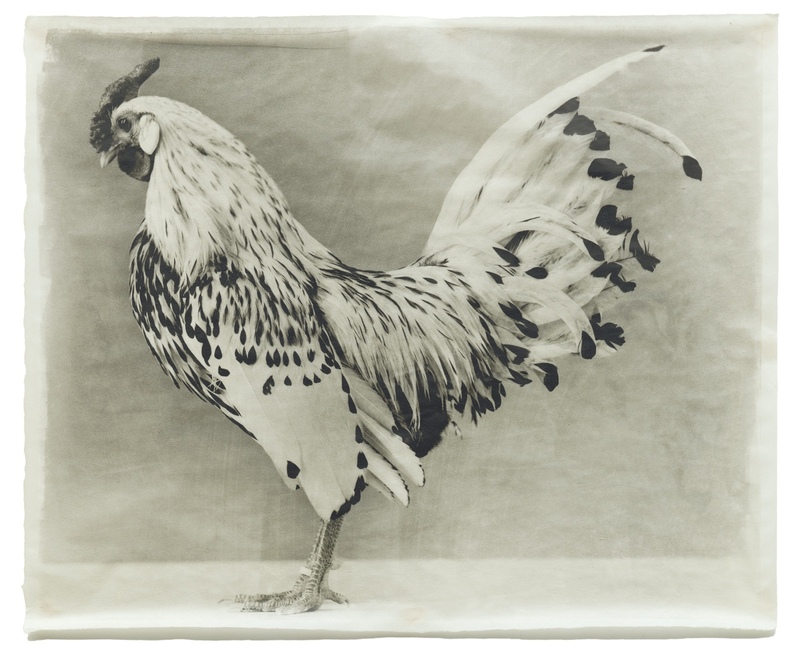 Framing each fowl alone, Pagliuso has captured these birds with remarkable, individual expression, inviting us to take a much closer look at the common species. 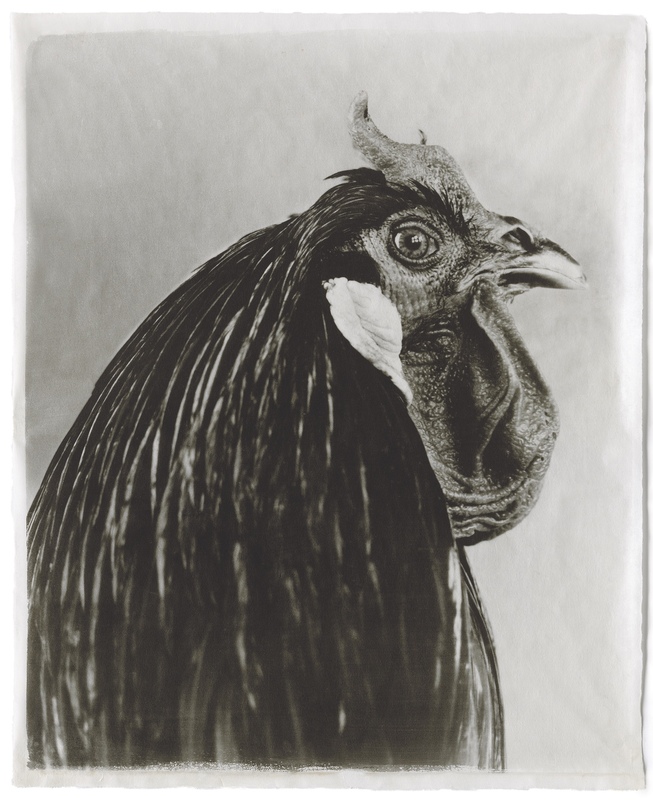 Her images were previously on view at Mary Ryan Gallery in New York, but they are now gathered in Poultry Suite, a book recently released by the University of Chicago Press. 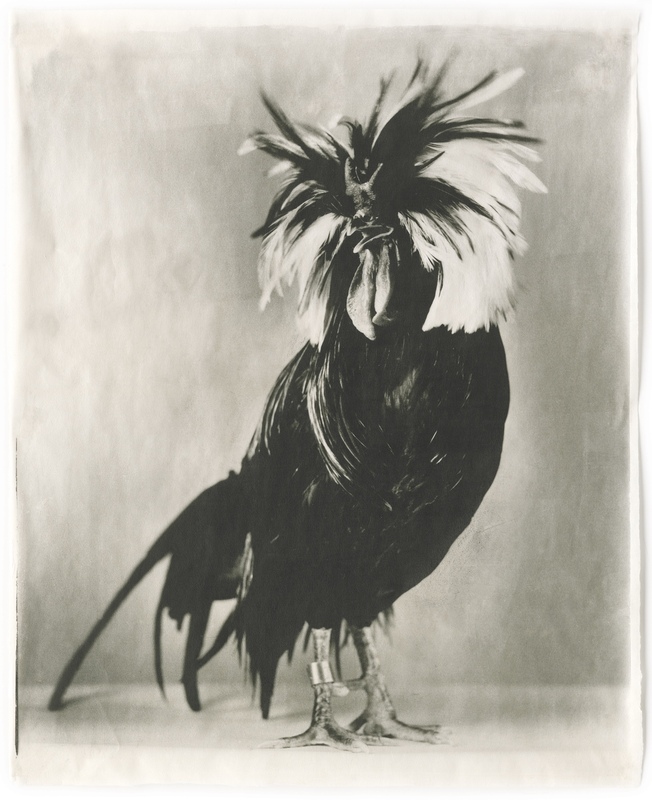 Featuring nearly 50 black-and-white photographs of over 20 breeds of chickens, Poultry Suite presents the simple winged creature as one would a sitter in a studio. 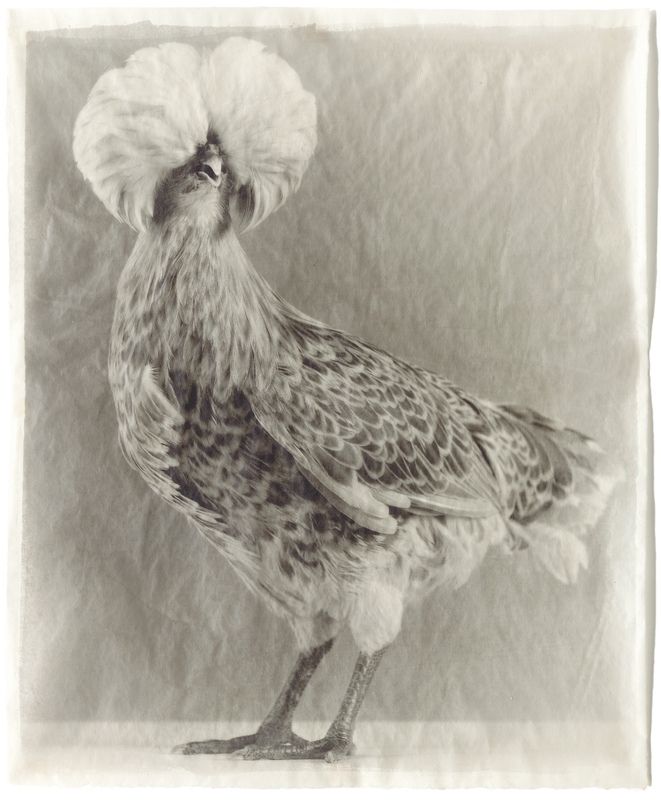 Pagliuso adopts the traditional style of the formal portrait, devoting each page to one bird shown against a plain background, full-bodied or closely cropped to its face. 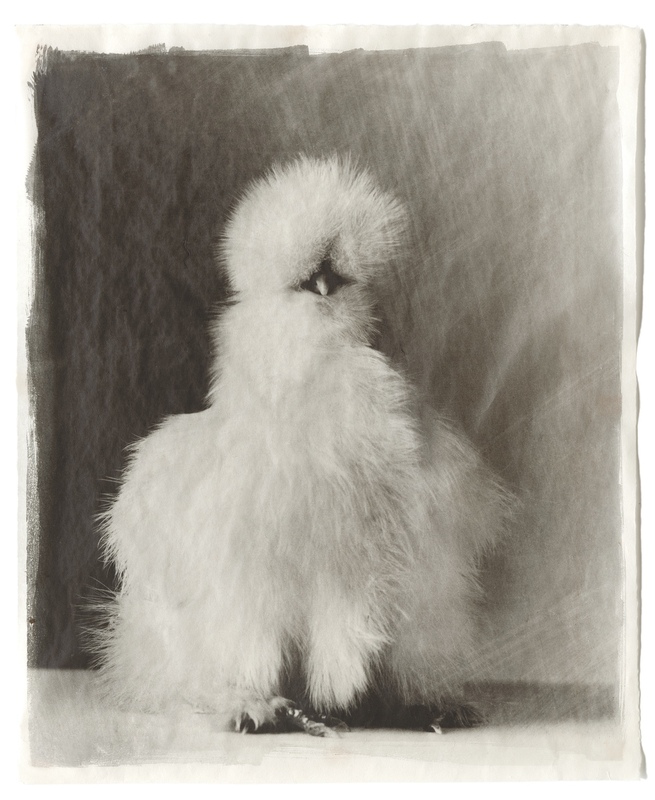 It’s surprising to flip through the pages and find oneself mesmerized by a usually overlooked creature, but Pagliuso’s poultry seem to have emotions. 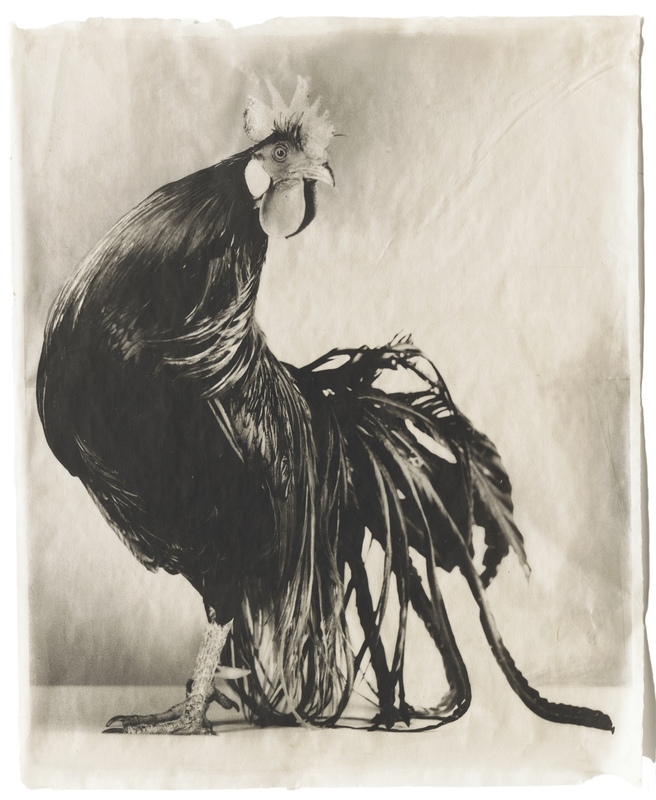 A black rooster with a gleaming eye appears cocky (pun unintended); a white one, with its sharp comb resembling the plates of a stegosaurus, gazes stoically away as if lost in thought. 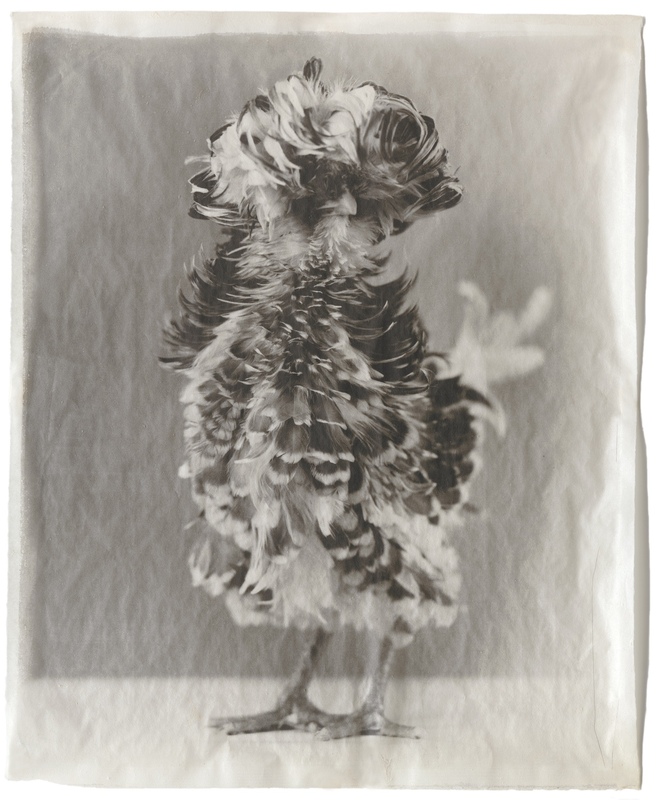 The birds’ plumages, though natural, also transform through Pagliuso’s lens into costumes that present them as exotic avians. Some are amusing, with extravagant headpieces; others are simply beautiful, with variegated feathers that resemble the patterns of stained glass windows. 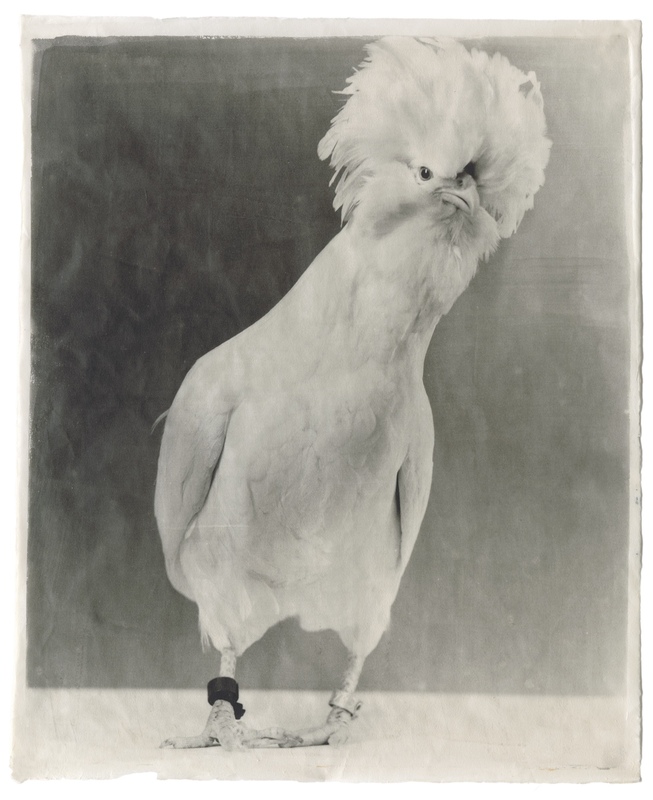 Granted, these are no ordinary chickens but rather the prized show birds Pagliuso helped her father breed in California; still, it takes a certain mastery of the photographic medium to render an animal usually recognized as food or farm resident with such dignity and mystery. 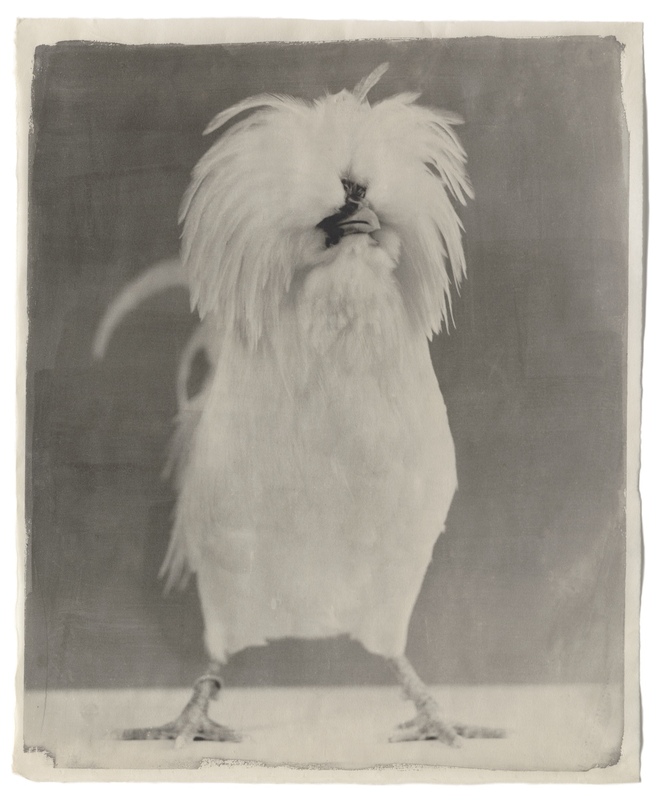 Eric Fischl notes in one of the publication’s many accompanying texts that the works are reminiscent of August Sander‘s portraits in that they adhere to strict documentation. Still, the gossamer texture of Pagliuso’s images, printed on soft, Japanese rice paper, have an illusory quality that bring to mind even portraits from the Victorian era. 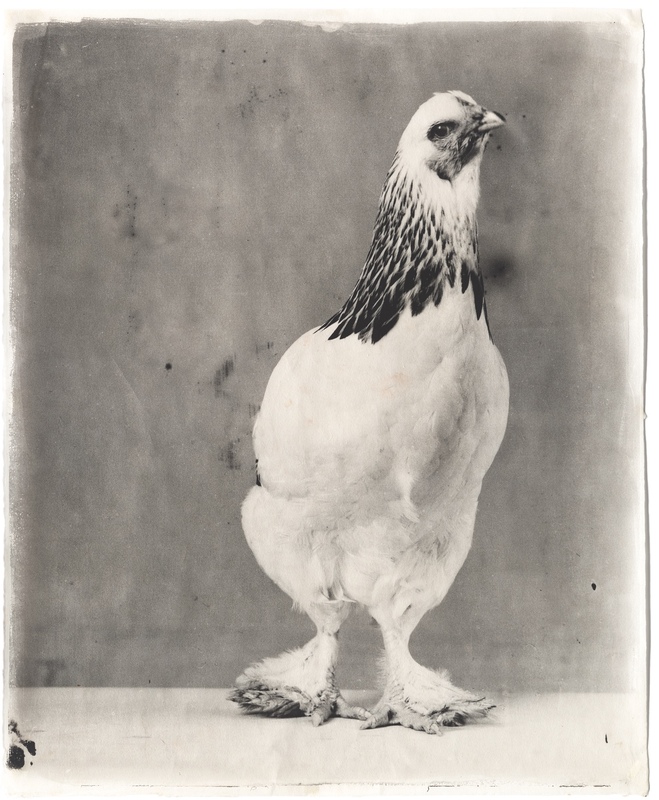 Portraits of animals are, of course, not novel, but rarely are they elevated, with such subtlety, to possess a natural nobleness. Although working in another medium, British painter George Stubbs is one who accomplished this as well, long before Pagliuso. Choosing most often the horse as his model (a series of these works is currently on view at the Metropolitan Museum of Art), he studied its anatomy closely to paint his steeds with realistic detail while still invigorating them with personality. Both his works and Pagliuso’s are not overly anthropomorphic, and it is this fine straddling of hard reality and open possibility that makes their sitters so magnetic. 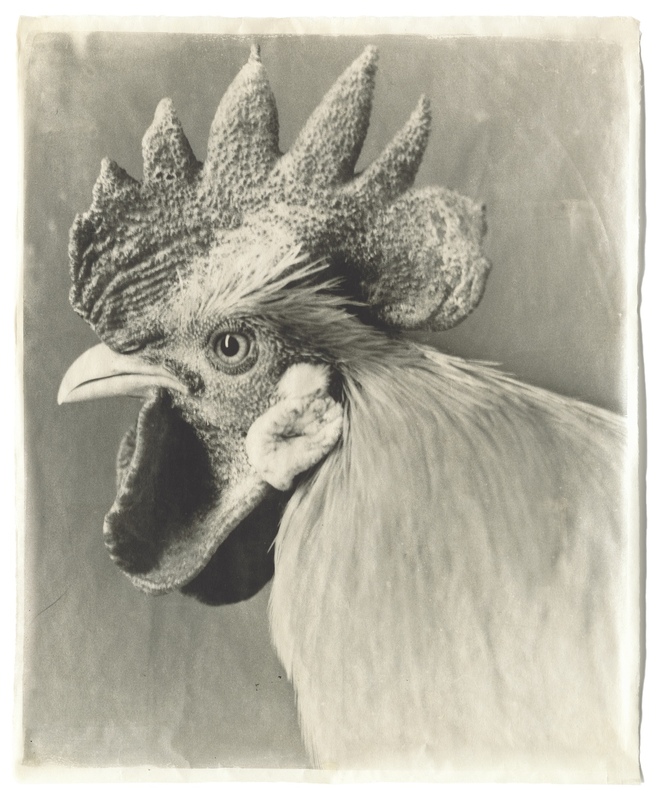 Poultry Suite is available via the University of Chicago Press.